Composite doors are amazing home improvements in Coulsdon. Their stunning style will enhance the appearance of your property and the incredible functionality will improve the performance. Our composite doors excel in all areas, making them an overwhelming choice for any Coulsdon home. They are fast becoming the most sought after option for front doors throughout the area. Here at Marathon Windows, we offer outstanding composite doors to our customers, ensuring that they benefit from the very best of everything. We have provided a handy guide to composite doors in Coulsdon to help you see how you could benefit from these spectacular home improvements. 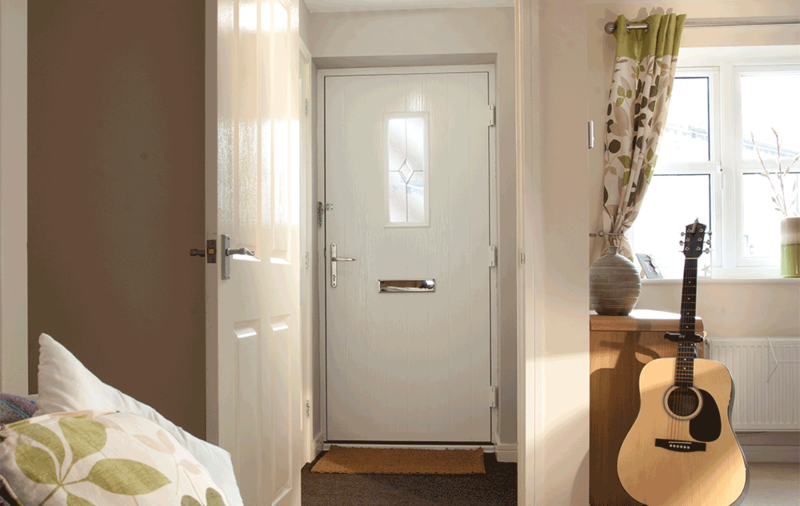 Our composite doors will keep your Coulsdon home warmer for longer. The Consort design that we work with incorporates a solid foam core with a glass reinforced plastic outer coating, making it incredibly insulating. The uPVC frame features thermal inserts too, ensuring that these doors offer the very best thermal performance for your home. These stunning doors come with an energy efficiency rating of ‘B’ as standard, however, we offer additional features that can enhance their performance to an ‘A’ rating if needed. Not only will this make your home warmer for longer, helping you to save on heating costs, but with such a high thermal performance, you could even find that your EPC rating is enhanced. One of the main features of any front door is that it offers security for your home. Composite doors make ideal front doors as they excel when it comes to home protection. We then support this inherent security performance by fitting the doors with the very latest multipoint locking systems. Your home and family will be thoroughly protected by our composite doors. This police preferred specification confirms that these doors have been rigorously tested and are capable of withstanding even the most intense physical attack. These doors are an unrivalled choice for the security of your Coulsdon home. One of the most impressive features of composite doors is the stylish entrance that they provide for your home. Its construction process results in a natural timber appearance that is truly authentic. As you’ve already seen, this wood aesthetic is complemented by all the technology and innovation of uPVC, making it high performance too. Our composite doors in Coulsdon come in a variety of stunning panel designs, enabling you to find the perfect match that ties in with your property’s architecture. Whether you live in a modern new build or a period property, you will be able to enjoy a door that enhances your home’s character. We also offer a range of colour finishes to our customers, so that you can create an entrance that reflects your personality and your property’s aesthetics. With our composite doors, every detail is taken into consideration, enabling you to choose the ideal decorative glazing, hardware options and accessories to get a final look that is exactly the way you want it to be. Unlike timber, composite doors require very little maintenance. There will be no costly and time-consuming stripping, sanding, painting and varnishing to keep your new front door in shape. All that you will ever need to do, is give your door an occasional clean to keep it looking like new and performing at optimum levels. In addition, our doors are designed to last for many years to come. Timber doors can be affected by the elements, making them split, rot and warp. They are completely weatherproof, protecting your home from torrential rain, bitter cold and gale force winds. No matter what the weather, your new door will never be warp or crack and the finish won’t fade, blister or peel. These impressive front doors are designed to be long lasting, giving you many years of pleasure. Composite doors prices in Coulsdon from Marathon Windows are fantastic, offering you great value for money. You can access a personal quote easily and efficiently with our online quoting engine. Simply enter your specifications, and our system will present you with the costs, adapt and amend until you have the perfect composite door for your tastes and your budget. You can also contact us and our friendly team will help you with any questions you may have, providing expert assistance with composite doors in Coulsdon.